A cool sea breeze. Waves crashing in the background. The warm sunshine beaming down on you. Yes, for many people that does sound like a good time. But what if we were to throw in a majestic ocean-side house into the mix? 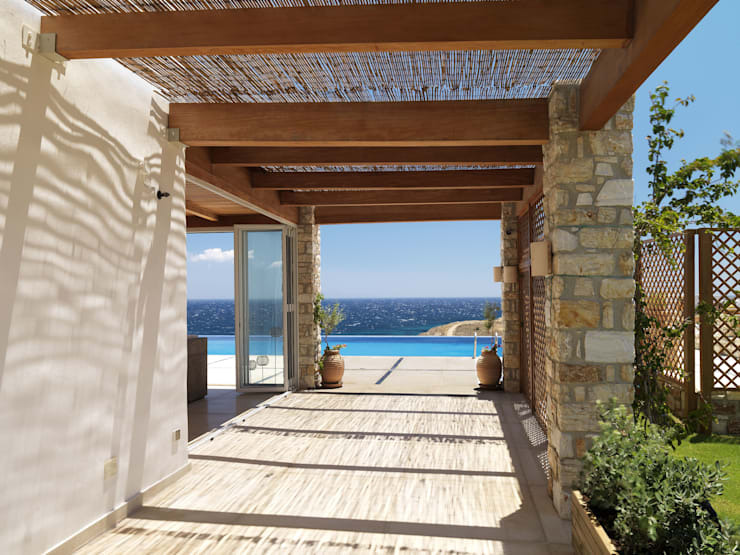 Follow us all the way to Greece as we scope out one fantastic residence inspired by the classic Mediterranean and rustic design styles. Our architect of the day, Carlos Eduardo De Lacerda, is most definitely in the know when it comes to sculpting dream-like structures, as he conjured up this 800-square metre creation with utmost delicacy and dedication. The project started all the way back in 2005 as a vacation spot where the owners could break away to the sea side with friends whenever life got out of control. Let’s discover this magical place, dubbed very appropriately “Villa Seacrest” by its creator. A delightful mix of charm, beauty, and relaxation immediately descends upon us as we see the facade. White concrete and grey stone stand out most strikingly against a crystal blue sky. And since we already know that the ocean is not too far, we can already feel that characteristic beach feel in the air. To make the most of this outstanding location, the house was built on a raised platform on top of the bright green lawn. 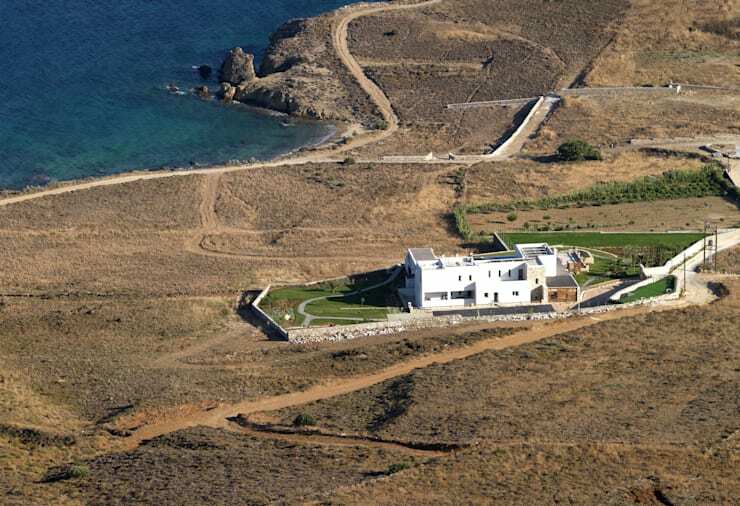 A dry, arid-like landscape surrounds the plot, making that white concrete house and green lawn stand out even more. And just metres away is the majestic ocean, with its roaring waves a permanent and exquisite feature of this supreme location. 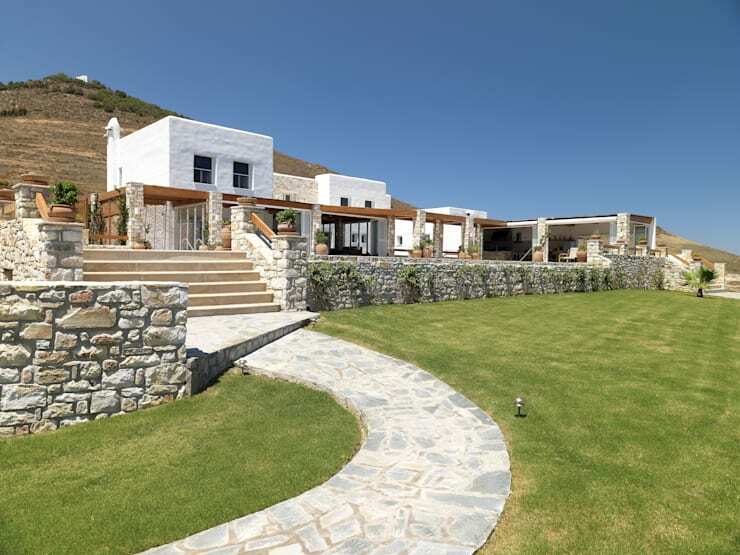 Mediterranean or not, be sure to scope out our fantastic range of houses here on homify. It would be unthinkable to visit a seaside house in Greece without a splashing spot somewhere. 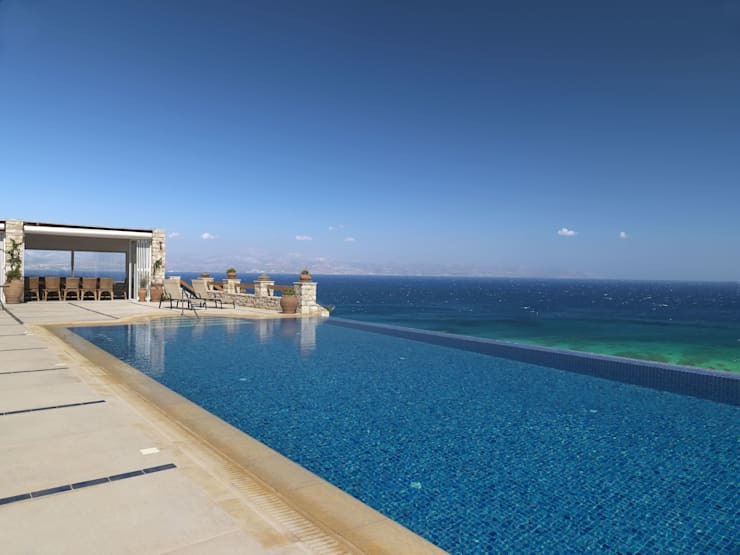 Well, our architect went all out and treated the owners to a luxurious infinity pool that forms a visual continuity with the ocean on the horizon. Sky, sea, and pool thrust a decadent mixture of blues into this exterior setting, made even more picturesque by that stunning patio, exterior dining set, and loungers to soak up the sun and scene in total style. Want to see some more stunning swimming pools? Then check out The A-List House. Living by the sea presents a few challenges, especially in a warm climate like here in Greece. But our architect was one step ahead. By adding an overhang to the side of the house, with thin reeds forming the roof, the sunlight is filtered slightly, causing only a handful of rays to reach the entry-point of the house; thus, ensuring that it's interiors are significantly cooler. On a great, big plot like this one we can surely expect the interiors to follow suit. And we are not disappointed, for the house makes splendid use of open-plan layouts to allow that stunning seaside vibe to flow freely inside. 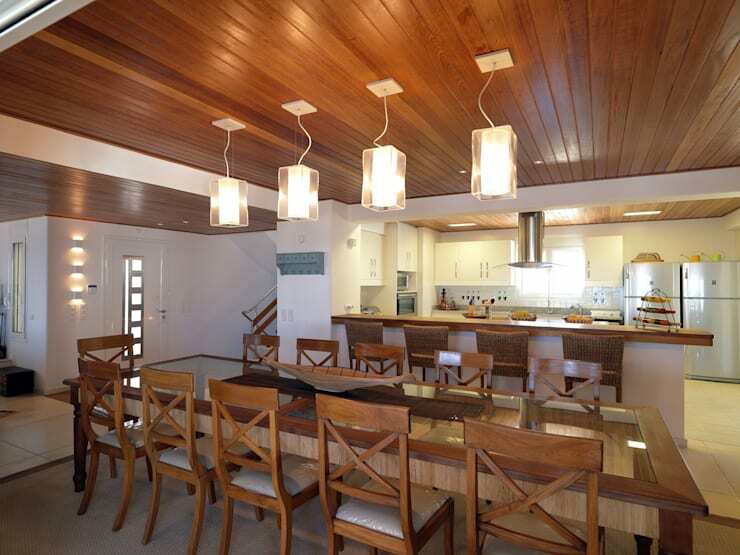 Here we see the kitchen and dining room, separated ever so slightly by a peninsula that serves as a breakfast bar. Even though rustic and Mediterranean is the order of the day, we can clearly see a stylish amount of modern style: thin plates of glass, polished wooden surfaces, and chic pendant lights dangling from the ceiling. What do you get when you mix wood, rattan, neutral tones, an ocean view, and a giant amount of creativity? This living room! Our architect displays his devotion to beauty most splendidly with the layout of this living room, with cool, neutral tones and Mediterranean pieces forming a superb relaxation spot. We close off our tour with a quick glance at the exterior dining set, located by the pool. It is clear that the exterior settings are bit more rustic than the interiors, yet they still display a fantastic amount of style. Rattan chairs and a rustic wooden table serve as the socialising zone when it comes to al fresco entertainment. 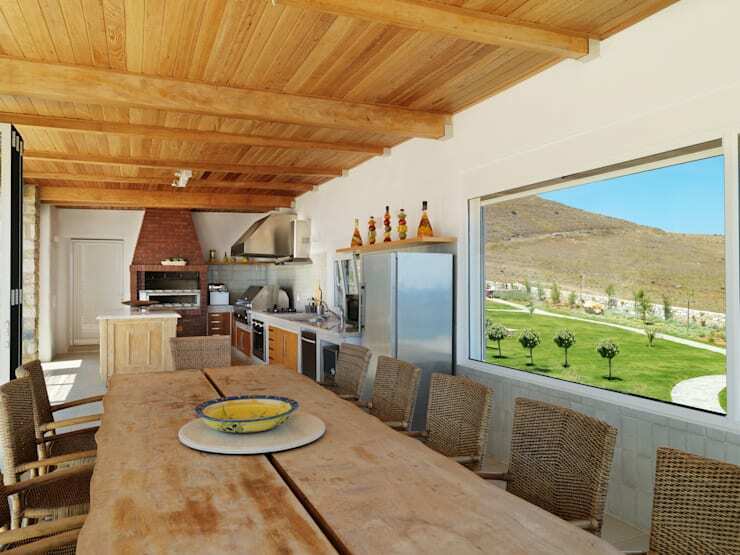 And a fridge, kitchen counters, and barbeque dishes up more than enough space for prepping, cooking, and displaying a number of five-star courses. Most definitely one of our ultimate favourites here on homify! Like it? Love it? Or not your style at all? Tell us what you think of this beach house beauty.